Though it’s only 20 sq km in size, Beirut is a complex, volatile melting pot of cultures and subcultures, religions and sects, neighborhoods and communities. There’s a puzzling relationship between its people, their politics, socio-economics and history, and the city’s architecture, geography and urban planning – or lack thereof. Lebanese artist Marwan Rechmaoui’s current exhibition at the Sfeir-Semler Gallery is a gloomy look at Beirut’s complicated neighborhood divisions, turning the city into a would-be battleground divided along new demarcation lines. 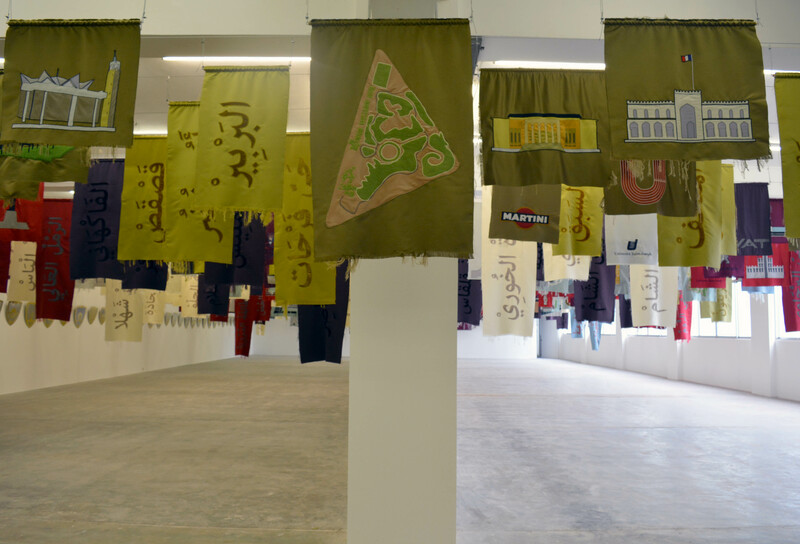 Drawing inspiration from Europe’s medieval period and its blazonry practices, the “Fortress in a Corner, Bishop Takes Over” exposition is a series of more than 400 vibrant flags designated for specific Beirut landmarks and 59 shields made of brass and steel representing each city district. Rechmaoui says the Lebanese are perpetually ready for war, displacement and escape, admitting it’s a pessimistic stance: “We are on guard all the time; we listen to the news to see how the day is going to be, expecting the worst.” He adds that although it’s only a war of words perpetuated mostly by politics for now, he thinks a real civil war can erupt. Using Beirut’s 59 districts allotted by Electricite du Liban, Rechmaoui categorizes each district according to the references in its names. Some of the areas are named after geological elements, others after sectarian symbols and individuals, some have horticultural references, others architectural references and some get their names from prominent local families. Borrowing the historic European blazonry systems for the shields, he also ranks neighborhoods by size and creates shields in corresponding sizes – so those of larger neighborhoods are actually bigger than those of smaller neighborhoods. The flags represent the multiple landmarks in each district, with each of the categories represented by a different color flag. What’s interesting is that Beirut’s chaotic, hardly existent street-naming system is ignored in Rechmaoui’s exhibition, using instead more organic identification already used by the city’s inhabitants. Of the landmark references he says: “It’s an addressing system here; it’s convenient for the Beirutis and they know how to work with it.” While many of us don’t know official street names we all know and use other references to explain where we live to visiting friends, or tell a “service” taxi driver where we’re headed. Rechmaoui was partially inspired to create this project by Siena, Italy, where until today annual celebrations mark bloody 13th century battles among rival neighborhoods. To him, there’s a stark contrast between the Italian city’s festivities commemorating a once-fierce division, and Beirut’s inability to reconcile its differences. While he remains doubtful about Beirut’s future, his artwork is in fact an insightful representation of the city’s complex urban landscape, which – intentionally or not – does in some way celebrate its intricacies. There’s a uniqueness in our addressing practices, and while that isn’t the main purpose of the artist’s work, is an accurate description of something we encounter in our daily lives. Walking around the exhibition, many visitors happily observed and chatted about familiar landmarks and neighborhoods. The exhibition is on at Sfeir-Semler in Karantina until May 7.